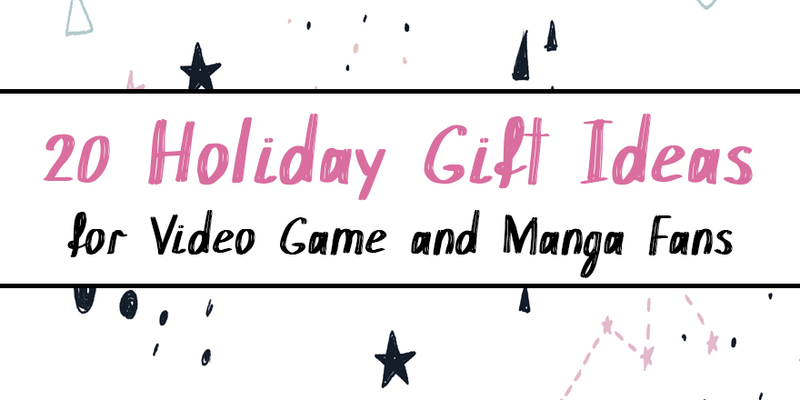 Even if your giftee is not a huge manga aficionado, I have some great options to get them reading more manga if you want to show them what they’re missing out on! In terms of games, I’ve picked a few specific game suggestions and a whole lot of awesome merch, as well as more general items for people with lots of interests. I’ve rounded up 20 great choices for potential giftees, or even a special gift for yourself! Finally, please note that this post is chock full of affiliate links. If you click on one of my affiliate links and purchase one or more items, I will get a small commission, even if it isn’t the item linked. It doesn’t cost you any extra and it really helps me out, so please consider doing your holiday shopping with my affiliate links! You can find my full list of affiliate links here. Now, let’s dive into the 20 awesome gift ideas I’ve rounded up for this holiday! 1. A Classic Gamer Christmas sweatshirt (TeePublic) – Who doesn’t love a good “ugly” Christmas sweater? 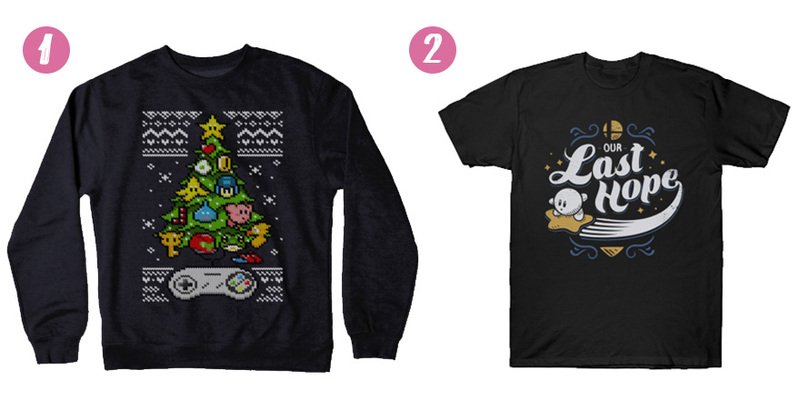 This video game pixel art Christmas sweatshirt will be sure to put a smile on anyone’s face! You can get the sweatshirt in many different base color options, or the design as a t-shirt, tank top, phone case, and more! Plus, all products from TeePublic are designed by independent artists! 2. Our Last Hope t-shirt (TeePublic) – This is the perfect gift for any Smash Bros. fan who is bound to already be getting the game! The design is based on the fact that Kirby is the last character left to go through the story mode, as seen in this Smash Bros. Ultimate trailer. Just like the Classic Gamer Christmas sweatshirt, the Our Last Hope design is available in a variety of other items such as a tote bag, mug, laptop case, or sweatshirt! 3. Mimikyu pin (Ugly Plants) – Ugly Plants has tons of adorable pins, t-shirts, plushies and more, both original and inspired by Pokémon! This Mimikyu pin would be perfect for any fan of the creepy-cute ghost Pokémon. Another favorite is this pastel bat pin… If your giftee loves all things kawaii, be sure to check out the Ugly Plants shop! Plus, all Chic Pixel readers can get 15% off a single order from now until December 19th with the code CHICPIXEL18! 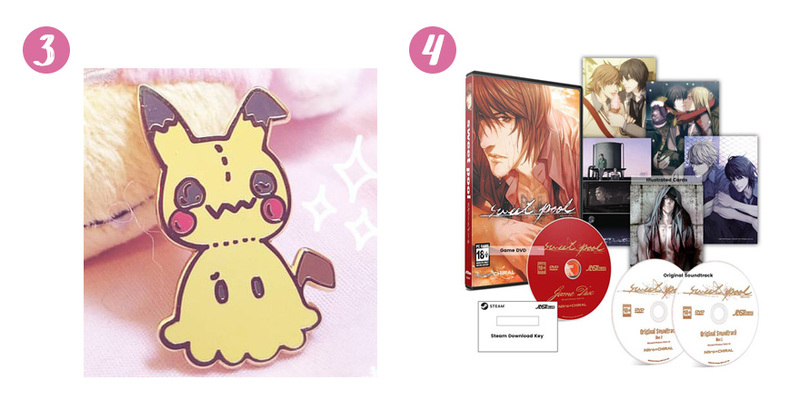 4. sweet pool (Jlist) – It’s hard to know what games people have and don’t have, but if you have a giftee that likes BL and horror, they’d probably love a physical copy of JAST Blue’s upcoming release sweet pool, which comes out just in time for Christmas! There’s even an amazing premium fan collection packed full of tons of goodies if you want to spring for something extra special, but keep in mind that it only comes with a download code for the game, not a physical copy. 5. Katamari Damacy Encore (CDJapan) – For another video game recommendation, might I suggest Katamari Damacy Encore, aka Reroll in English-speaking territories? The joy-filled PS2 game is back for a Nintendo Switch remaster, and if you preorder the Japanese version, you’ll even get an exclusive sticker sheet drawn by series creator Keita Takahashi! While I’m not sure whether or not the Japanese Switch version will feature English text (the game comes out in December), many recent Japanese Switch games that are also available in English do support English text, making them very import-friendly. Either way, the Japanese import would make a great gift for someone looking to practice their Japanese! Or, you can always pick up the English version. 6. 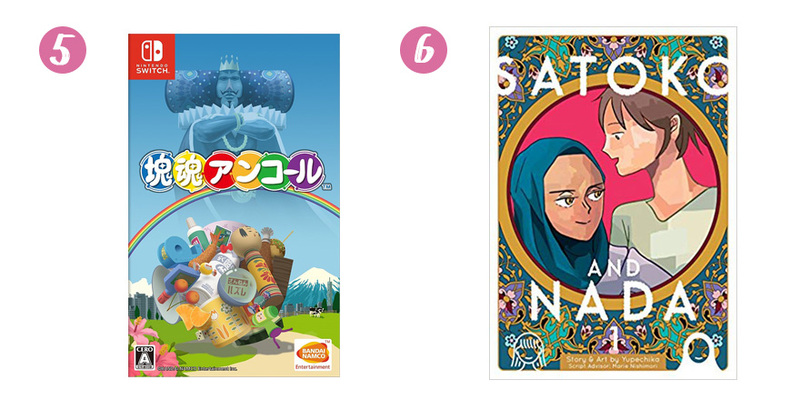 Satoko and Nadia Volume 1 (Amazon) – If your giftee is looking for a feel-good story about people from different cultural backgrounds respecting each other and appreciating their differences, look no further than Satoko and Nadia. This manga, which was just released in English in October, tells the story of a Japanese exchange student in the US who has a new Saudi Arabian roommate. Their humorous daily life will be sure to put a smile on anyone’s face! 7. 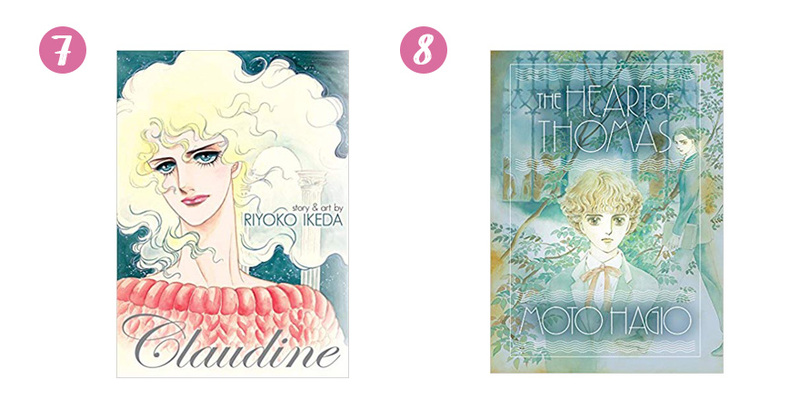 Claudine (Amazon, RightStuf) – Ryoko Ikeda, author of The Rose of Versailles, may be one of the most influential early shojo manga artists, but so far none of her classic works have been translated into English. That is, until now! Claudine is a single-volume manga about a trans man’s tragic life story told through his relationships with multiple women. Originally published in 1978, this manga represents an early example of a trans character depicted in shojo manga. Highly recommended as a gift to any manga fan, or a friend or loved one you would like to introduce to the wonderful world of manga! 8. Heart of Thomas (Amazon) – For a slightly different shojo manga recommendation, I highly suggest Heart of Thomas for anyone who might be interested in learning more about early boys’ love, or shōnen ai. Heart of Thomas is a highly influential shōnen ai manga from an era that went on to inspire many current shojo and boys’ love manga. Just like Claudine, this story is told in a single volume, meaning your giftee won’t need to worry about picking up more books to see the ending later on. 9. 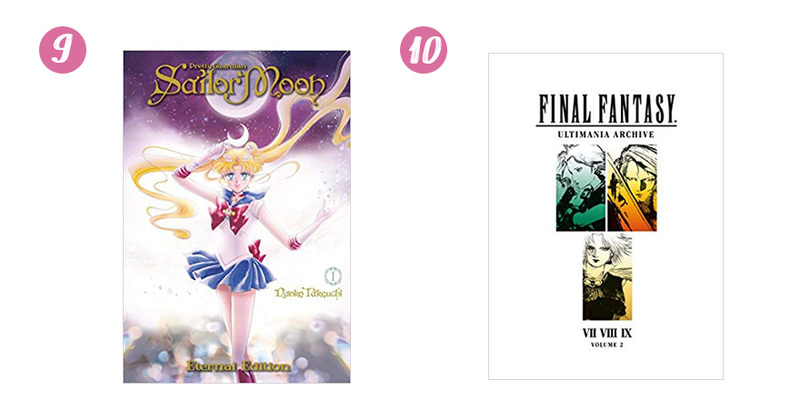 Sailor Moon Eternal Edition Volume 1 (Amazon) – There have been quite a few versions of the Sailor Moon manga published in English, but none is more gorgeous than Sailor Moon Eternal Edition! Not only does this edition feature an all-new translation, but it’s printed on high-quality paper in a larger format than regular manga. It’s a must for any Sailor Moon or shojo manga fan! 10. Final Fantasy Ultimania Archive Volume 2 (Amazon, Rightstuf) – The Final Fantasy Ultimania Archive series will be sure to thrill anyone who likes Final Fantasy games! Released this year for the first time ever in English, the Ultimania books provide a definitive guide to the world of Final Fantasy. Volume 2 contains Final Fantasy VII, VIII, and IX and comes out on December 18th. 11. The Legend of Zelda: Breath of the Wild Creating a Champion Hero’s Edition (Amazon, RightStuf) – This massive, 400+ page book features an extensive look at the gorgeous world of The Legend of Zelda: Breath of the Wild The Hero’s Edition is a little on the pricey side at $90, but it comes with a fancy slipcase cover, cloth map of Hyrule, art print, and a glass replica of a spirit orb. Oh, and of course the book is chock full of concept art and illustrations from the hit game! If the Hero’s Edition is a bit too steep, the regular edition will only cost you about $25. 12. 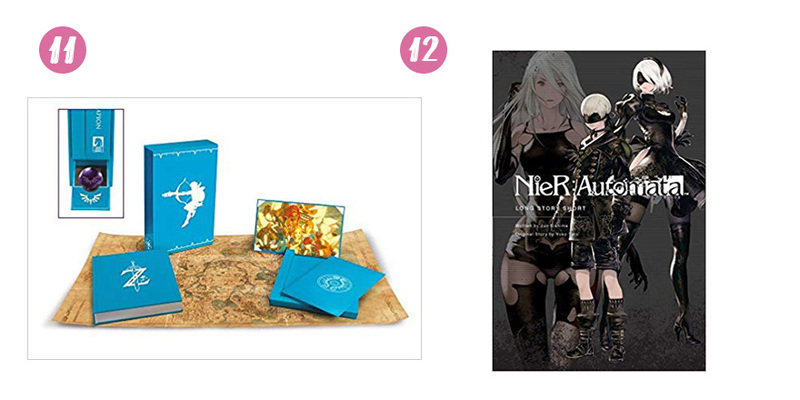 NieR: Automata Long Story Short (Amazon, Rightstuf) – If your giftee feels a gaping hole in their heart after completing NieR: Automata, this book might be the for them. It generally recaps the plot of the game, but also ads some additional context from the point of view of the characters! 13. Legends of Localization Book 1: The Legend of Zelda (Fangamer) – The Legends of Localization series is the perfect gift for aspiring localizers or video game fans interested in the art of localization! The Legend of Zelda‘s localization is full of interesting tidbits that are all explored in-depth in this lovely book. Other Legends of Localization books include Earthbound, Press Start to Translate: This is What Happens When You Let a Computer Translate a Video Game?, and This Be Bad Book Translation, Video Games!. 14. 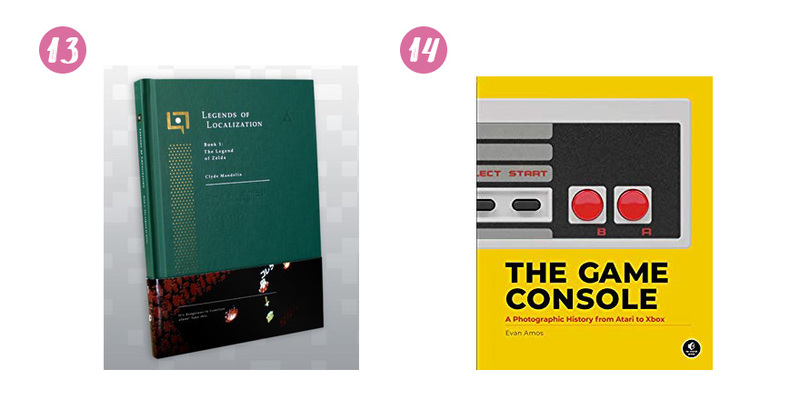 The Game Console: A Photographic History from Atari to Xbox (Amazon) – This book would be the perfect coffee table book for any video game fan! It’s full of gorgeous photographs of nearly every console you can think of, providing an all-new perspective on your favorite video game consoles. 15. Splatoon 2 Aquabeads (AmiAmi) – This Aquabeads set may be a Japanese release, but as long as you can follow the template visual, you’re well on your way to doing this fun Splatoon 2 Aquabeads kit! 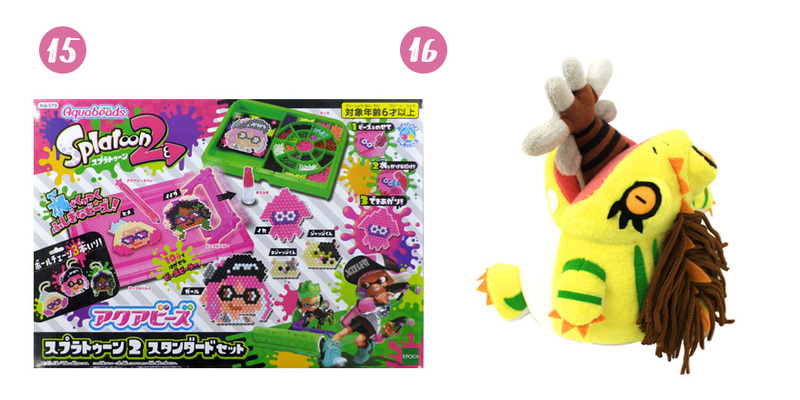 It would even be a fun present for a Splatoon 2 player looking to practice their Japanese language skills while making some cute crafts. 16. Great Jagras Plush (AmiAmi) – Monster Hunter: World was a resounding success earlier this year, so it’s very likely you know someone who played it! For a fun little gift, why not try this fun (albiet slightly morbid) Great Jagras plush? There are other Monster Hunter: World plushies too, like this super cute Paolumu and Pukei-Pukei! 17. Muramasa Nekomata figure (CDJapan) – Muramasa: Demon Blade may be an older Vanillaware game, but they’re still making figures based on the gorgeous character art! 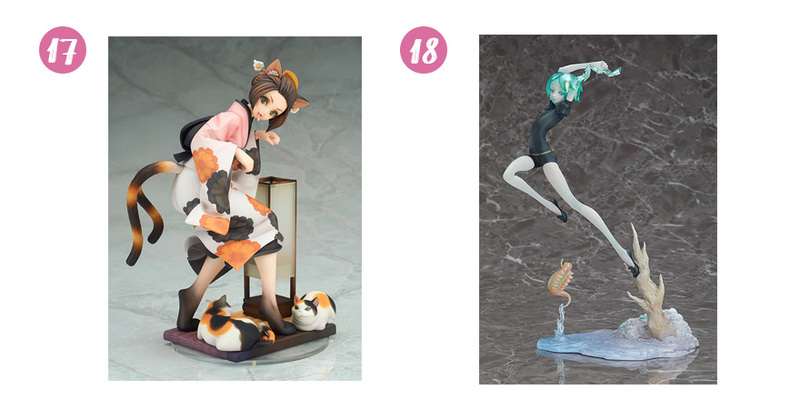 This Nekomata figure is super detailed and quirky – perfect for a cat lover, Vanillaware fan, or figure collector looking for something a bit different for their collection! 18. Land of the Lustrous Phos figure (CDJapan) – Land of the Lustrous is one of my favorite anime and manga series of recent years. If you know someone who’s all caught up on the English manga releases that you’d like to get an extra special gift, why not this amazing Phos figure? It beautifully captures the other-wordly feel of the series’ art and is sure to impress! 19. Kingdom Hearts Sora Nendoroid (CDJapan, Rightstuf) – If you know someone who can’t wait for Kingdom Hearts III to come out in January, the Sora Nendoroid will make the perfect gift! He’s drop-dead adorable and comes out in December (note that at this point there isn’t a release date so it may not make it in time for all holidays). 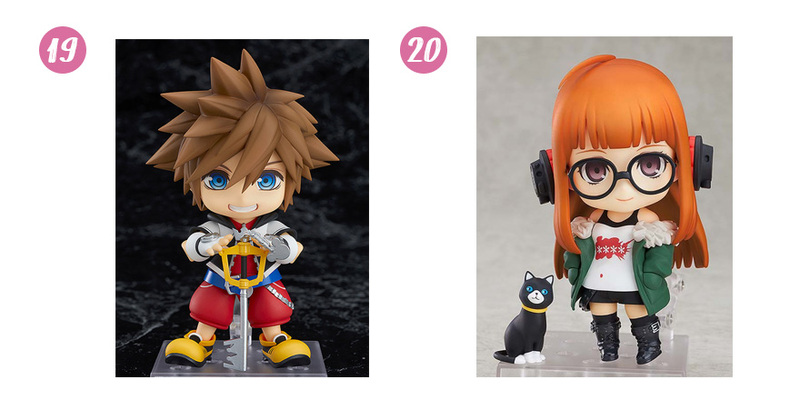 He’d also pair perfectly with the Riku Nendoroid that comes out in January! 20. Persona 5 Futaba Sakura Nendoroid (CDJapan, Rightstuf) – The Futaba Nendoroid also comes out in December (again, as of this post I can’t confirm the exact release date) and would make an awesome gift for anyone who enjoyed Persona 5. If you’d like something Persona 5-related that will definitely be available in time for Christmas, the rhythm game Persona 5: Dancing in Starlight comes out on December 4th! I hope this list helps you with your holiday shopping! Remember, the most important thing this holiday season is to take care of yourself and others and letting the people in your life know you love them. Be sure to spread some joy, even if it isn’t through giving gifts that have monetary value. But if you do decide to buy some gifts thanks to this guide, I really appreciate it if you use my affiliate links. Thanks for reading and have a wonderful holiday!